Documentation for Red Hat Enterprise Linux 5 covering checking system performance, tuning, kernel configuration and extending the file system exists in a variety of places. Expert Ken Milberg gives pointers for where to look and shares some of his favorite tools. I am working with RHEL5, and want to know how to check the System performance, System tuning and how to reconfigure the kernel. I also want to know how to extend the file system. 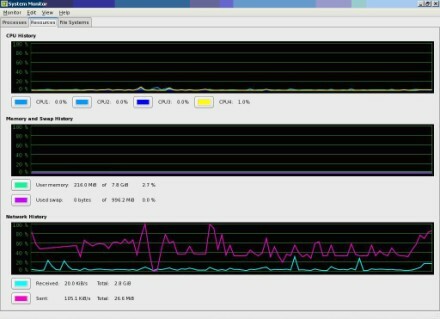 Also, is there a command to check the memory utilization and speed of traffic of network loads? Please suggest any basic book or resource to view all System commands for RHEL5. There are tons of resources available for information on RHEL5. You should start with the documentation available on the Red Hat site where all the RHEL documentation resides. There are systems administration manuals, reference manuals and even tuning guides. One of my favorite commands for performance tuning is vmstat. It's available on every version of Unix or Linux available, and provides data on memory, cpu and I/O. Here is a vmstat snapshot from a system (lightly used) which clearly illustrates the various sections of information; memory, CPU and I/O. Top is another important utility that you should have in your repertoire. It's a character based GUI which provides a quick and dirty snapshot of your system. If you want something a little different – look at OProfile. This utility uses performance monitoring hardware on the processor to retrieve kernel type system information about the executables on a system. If you prefer a graphical interface, the GNOME System Monitor is a tool you should be looking it. The software is X based and has a pretty looking front-end. Regardless of which tool you use make sure you follow proper tuning procedures, test all your changes outside of production first and also make only one change at a time.